As we look forward to the 500th anniversary of the Protestant Reformation on October 31, this sermon is about the classic Protestant doctrine of Sola Scriptura, “scripture alone”—which means that the Bible is the ultimate authority guiding our Christian faith and practice. Of course, in our culture today, the Bible’s authority is under constant attack. It’s even under attack in the church, including the United Methodist Church! With that mind, I pray that these next two sermons on Sola Scriptura will give you confidence in God’s Word. We can trust it! Every word of it! We can build our lives on it! To make sense of what I’m about to say, let me define a term with which most of us Protestants will be unfamiliar: purgatory. This is the Roman Catholic doctrine that says that when a Christian dies, they will likely have to be cleansed of their sins—or punished for their sins—prior to going to heaven. How long this period of cleansing or punishment lasts, well, depends on how sinful a person was. And before you ask, no, the doctrine of purgatory is not found in scripture. To make matters worse, church officials back in the 16th century were going around and telling mostly poor people that if they were willing to pay enough money—money which was used to build St. Peter’s Basilica in Rome—the church had the power to take time off their sentence in purgatory. Or even to take time off the sentences of their loved ones who were suffering in purgatory. And who wouldn’t want that for their loved ones? Five hundred years ago this October 31, Martin Luther inadvertently launched the Protestant Reformation when he nailed his “Ninety-five Theses” to the door of the All Saints Church in Wittenberg. One of his core convictions, derived from scripture, is that we are justified by faith alone. 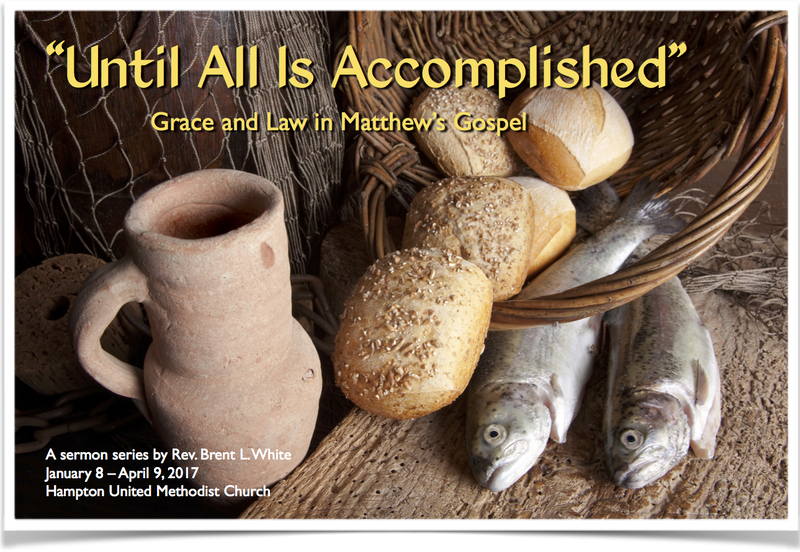 We Methodists share his conviction that we can do nothing to earn or merit God’s saving grace. It is only on the basis of what Christ has done through his life, death, and resurrection that we’re saved. Why does this doctrine remain relevant today? Why do we still need to hear this message? That’s what this sermon is about. 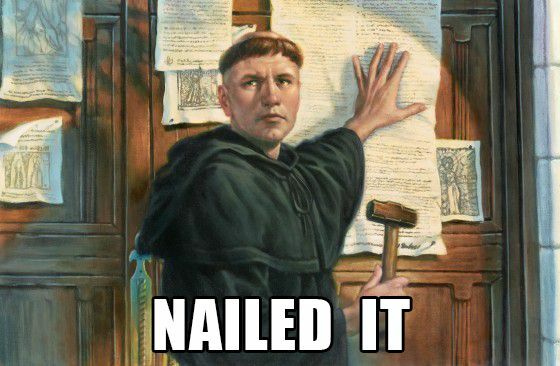 Nearly 500 years ago, on October 31, 1517, an Augustinian monk and theology professor named Martin Luther nailed a document, now known as the Ninety-five Theses, to the door of the All Saints Church in Wittenberg, Germany. It wasn’t unusual to nail things to that door; it was the equivalent of a community bulletin board—a way of making announcements, or in this case inviting church officials to debate him. In this document, he took issue with a particular practice in his church—the Roman Catholic church—that he believed was unbiblical, un-Christian, and needed to be reformed. Little did he know that this action would launch what would become the Protestant Reformation. A couple of centuries later, in England, it would even enable the establishment of our own Methodist church. As Methodists, we are Protestants. 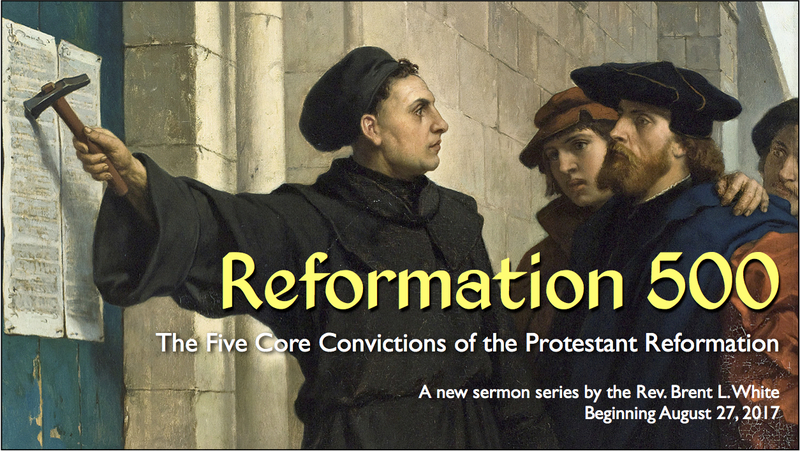 And I know that’s just a label, and we probably haven’t thought much about what it means aside from knowing that it means, “Not Catholic.” But in this new sermon series, celebrating the 500th anniversary of Protestantism, I want to talk about the five core convictions that nearly all of us Protestants have in common. Because I believe they’re still relevant today. And I believe if we take each of them to heart they will help us fall in love with and glorify our Lord Jesus more and become more faithful followers of him. The first duty of the preacher of the gospel is, through his revealing of the law and of sin, to rebuke and to turn into sin everything in life that does not have the Spirit and faith in Christ as its base. Thereby, he will lead people to a recognition of their miserable condition, and thus they will become humble and yearn for help. 1. Martin Luther, Preface to the Book of Romans (Franklin, TN: Seedbed, 2016), 18. Faith is a living, unshakeable confidence in God’s grace; it is so certain, that someone would die a thousand times for it. This kind of trust in and knowledge of God’s grace makes a person joyful, confident, and happy with regard to God and all creatures. This is what the Holy Spirit does by faith. Through faith, a person will do good to everyone without coercion, willingly and happily; he will serve everyone, suffer everything for the love and praise of God, who has shown him such grace. It is as impossible to separate works from faith as burning and shining from fire. Therefore, be on guard against your own false ideas and against the chatterers who think they are clever enough to make judgments about faith and good works but who are in reality the biggest fools. Ask God to work faith in you; otherwise you will remain eternally without faith, not matter what you try to do or fabricate. 1. Martin Luther, Preface to the Book of Romans (Franklin, TN: Seedbed, 2016), 14-15. Are Methodists Sola Scriptura or Prima Scriptura, and what’s the difference? I’ve read more than a few Methodists recently who have sought to distinguish what Methodists believe about the Bible from what Martin Luther and the other Reformers believed about the Bible. These Methodists say that we hold to the doctrine of Prima Scriptura (“scripture first”) rather than Sola Scriptura (“scripture alone”). Is this true? And what is the difference? First, let me apologize for not knowing these answers already. I went to Candler, after all. I’m always playing catchup. I suspect that when a Methodist says that we are Prima Scriptura, what he means is that we also hold in high regard other authorities for guiding our Christian lives—for example, tradition, reason, and (ugh!) experience, even as these authorities mustn’t contradict what God’s Word plainly reveals. If a Methodist insists that he’s Prima Scriptura, then he is likely basing it on Wesleyan scholar Albert Outler’s misbegotten or badly misconstrued Wesleyan Quadrilateral, a formulation that he himself lived to regret. But what Protestant doesn’t at least believe that tradition and reason aren’t important or necessary in guiding our theology and behavior? 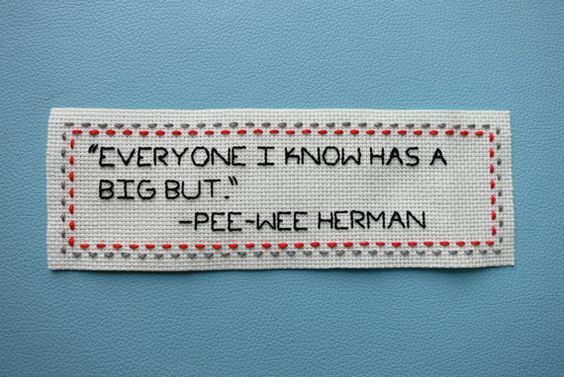 O.K., I know there are a few, at least in theory. Congregations within the Church of Christ tradition, for example, refuse to use instruments in worship because the Bible, or at least the New Testament, makes no explicit reference to instruments in worship. The New Testament’s silence on the subject, instead of permitting us the opportunity to think it through, must mean prohibition. That represents an extreme edge of “scripture alone,” but only insofar as we disregard the Old Testament. Another example: The Church of England had an ongoing debate with Puritan nonconformists over the issue of iconoclasm, which is why, even today, a typical Presbyterian church sanctuary is less ornate than most other churches. Puritans believed that the Bible’s silence on many traditional elements in Anglican (not to mention Roman Catholic) worship prohibited these elements. Again, while this Puritan view represents an extreme interpretation of Sola Scriptura, it’s a small minority opinion within Christendom, and it wouldn’t have been shared by most of the Reformers, all of whom (to my knowledge) affirmed Sola Scriptura. I know for certain that Luther, who believed in Sola Scriptura, also accepted tradition and reason. So why do some Methodists insist that we are, contra the Reformers, Prima Scriptura? I have my suspicions, but at least a part of me is sincerely curious: What’s the difference between Prima and Sola Scriptura? This Sunday I’m preaching on Luke 18:9-14, the Parable of the Pharisee and the Tax Collector. The villain of the parable, of course, is the Pharisee, who turns up his nose at the pitiable tax collector, saying, “I thank you, God, that I’m not like him,” among other sinners. And we want to throw stones at the Pharisee. How can he be so self-righteous? Oh, please! I’m just like the Pharisee, with one small exception: As a good Protestant, I believe that everyone, Pharisee and tax collector alike, must be saved by grace alone through faith alone. Once this happens, however—once we are justified and experience new birth through the Spirit—it’s back on the clock for you and me. It’s back to trying harder, to working harder, to proving ourselves to God all over again. By all means, the balance sheet was zeroed out when we got saved, but every new sin puts us back in the red, and God’s patience is wearing thin. The “clean slate” that we received when we first placed our faith in Jesus is getting filthier by the minute! We were like this tax collector at one time… But now that we know better, we are without excuse! So thank God we’re not like him anymore! I think all Christians face this temptation to self-righteousness, but I wonder if it isn’t more acute within Wesleyan Christianity: We’re the ones, after all, who place a greater emphasis on sanctification, on the inward change made possible by the Holy Spirit, than other Protestant traditions. We are not monergists, unlike our Calvinist brethren; we are synergists. We believe Christians willfully participate in our sanctification—even though that participation is also only made possible by God’s grace. 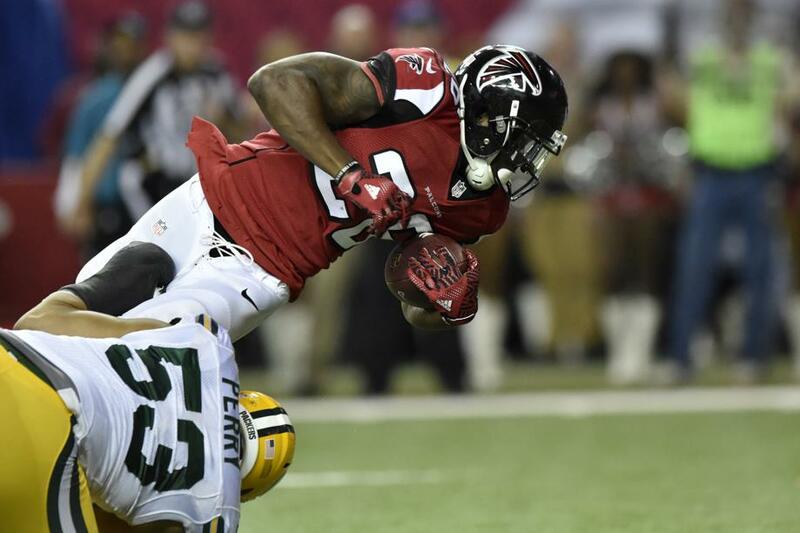 Did you catch that? If you’re not a Methodist, you probably don’t recognize that Wesley is saying, in so many words, that the Pharisee is following Wesley’s own “General Rules”! 1) Do no harm. 2) Do good. 3) Attend to the ordinances of God (another way of saying “use the means of grace”). It’s as if Wesley recognized the danger of turning even the General Rules into “the Law”! In my own case, this self-righteousness doesn’t hold others in contempt so much as it holds myself in contempt—for the reasons I cite above! “What’s my problem? Why aren’t I a better person? Why am I still struggling with sin?” In other words, why am I not keeping the Law successfully? With this in mind, I’m so grateful for the people at Mockingbird. 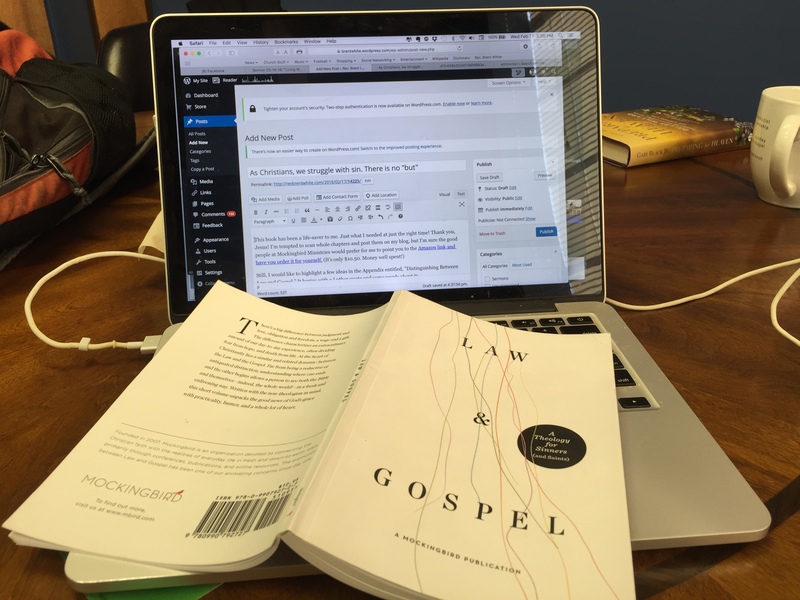 I’ve already sung their praises recently, but their reflections on the classic Lutheran distinction between Law and Gospel is absolutely what I need to hear right now. 4. The true antinomian is the one who tries to distort the Law. The one who reads “Be perfect, therefore, as your heavenly Father is perfect” (Mt 5:48) as “Do your best, that’s all anyone can ask.” Or who read “Sell what you own, and give the money to the poor” as “Tithe ten percent” or “Contribute what you reasonably can.” The very people who accuse others of antinomianism are usually the ones who are themselves denigrating the Law. Because if you want measurable spiritual progress or spiritual accomplishment, you’re going to have lower God’s standard quite a bit. 5. The antidote to antinomianism, therefore, is not to sell people on linear, measurable sanctification, but to preach the Law in all its fullness. The condemning voice of conscience should not be smoothed over by developing good habits, but should be echoed in the pulpit and taken to its extreme, as Christ does in Matthew 5. The only genuine way to relate to the Law is to be utterly condemned by it. Anything less—including using it for exhortation—risks real antinomianism. Oh, Methodist brothers and sisters: Let yourself be utterly condemned by the Law! Let yourself be utterly condemned by Wesley’s General Rules! Let yourself be utterly condemned by your own pathetic attempts at “measurable spiritual progress”! And then make your way to the cross of Jesus Christ. Remind yourself that “all our righteousnesses are as filthy rags.” Remind yourself that Christ was perfect on your behalf! Remind yourself that it’s only through his righteousness, and not your own, that you’re saved, and that even sanctification is by grace alone. Timothy Tennent, president of Asbury Theological Seminary, doesn’t blog often enough, but when he does he usually makes it worth our while. In this post, he points out the potentially dangerous fact that most of our fellow Methodists possess at least a vague understanding of John Wesley’s “heart-warming” experience at Aldersgate on May 24, 1738. I don’t know of too many Methodists who have actually read Martin Luther’s preface to the Book of Romans. The fact that the heart-felt experience of Wesley is far more known than the textual source of that experience is significant. We can all too easily forget that our experience of God’s work does not come untethered from the truth of God’s word. When Christian “experience” becomes disconnected from God’s Word it drifts into mere emotionalism. The phrase “Open Hearts, Open Minds, Open Doors” says absolutely nothing about Jesus Christ or the glorious gospel. It only speaks of our hearts, our minds and our buildings. Is that really the best we can do? As I have said before, if there were public relations consultants in the 19th century, the phrase “Open Hearts, Open Minds, Open Doors” could have just as easily emerged as a great tagline for a 19th century brothel. This reminds of something a professor at UMC-affiliated (and theologically orthodox) United Theological Seminary said about the UMC’s website. If it’s true, as we say, that the UMC’s mission is to “make disciples of Jesus Christ for the transformation of the world,” then doesn’t it follow that our church’s official website ought to reflect that priority? Perhaps the public website should take a more evangelistic approach. How about, right up front, a link to the testimonies of people who have accepted Christ and known his transforming power? How about a link to a video called something like, “Why Should I Choose Jesus?” Or perhaps a video, or at least a page, called something like, “Why Does Christ Make A Difference?” Perhaps one could have the option to chat or have a video call with a pastor. Maybe it would be helpful to have something on the basics of Christian belief. Or so said Bob Dylan in his 1966 song “Absolutely Sweet Marie.” Theologian Cornelius Plantinga, in his book about sin, Not the Way It’s Supposed to Be, offers reasons why this is true. Reflecting classic Christian teaching, Plantinga writes that sin and evil are a privation: they represent the absence of something, namely the good. Like a parasite feeding on its host, they require the good in order to survive. 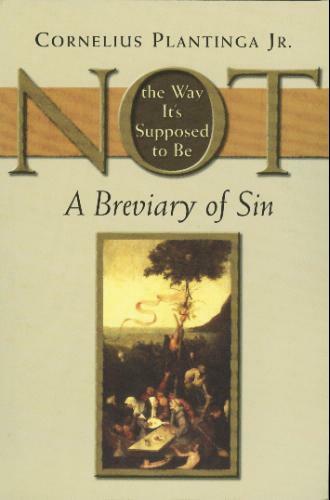 Nothing about sin is its own; all its power, persistence, and plausibility are stolen goods. Sin is not really an entity but a spoiler of entities, not an organism but a leech on organisms. Sin does not build shalom; it vandalizes it. In metaphysical perspective, evil offers no true alternative to good, as if the two were equal and opposite qualities. “Goodness,” says C.S. Lewis, “is, so to speak, itself: badness is only spoiled goodness. And there must be something good first before it can be spoiled.” Here Lewis reproduces the old Augustinian idea that evil “has no existence except as a privation of good.” God is original, independent, and constructive; evil is derivative, dependent, and destructive. To be successful, evil needs what it hijacks from goodness. Therefore, “good and evil grow together, intertwine around each other, and grow out of each other in remarkable and complicated ways.” He writes that biographers “make themselves students of this phenomenon,” especially in relation to towering religious or moral leaders in history. Good biographers find character ironies irresistible. Hence the attraction of Martin Luther, one of the three or four most prominent Christians after Paul, a doughty champion of the gospel of grace and a ghastly anti-Semite who wanted his readers to break down Jewish homes and house their occupants in stables. Other ironies appear in other characters including Luther’s most famous modern namesake. Martin Luther King Jr., one of the noblest and most eminent Americans of the twentieth century, adulterated his marriage and plagiarized some of the work that made his reputation. Thomas Jefferson held slaves. The Bible itself gives us such alloyed heroes as King David, a great and godly and wicked man whose name has been blessed by centuries of Jews and Christians. 1. Conelius Plantinga Jr., Not the Way It’s Supposed to Be: A Breviary of Sin (Grand Rapids, MI: Eerdmans, 1995),89. Tags: Bob Dylan, Cornelius Plantinga, Martin Luther, Martin Luther King Jr.